Hi, my name is BIG MONKEY. 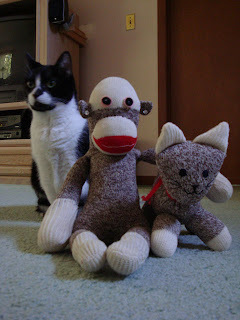 I live in Crystal Beach, Florida with my human, cat, and sock monkey families. Laura and Mark are the humans, and Karl and Megan are the cats. 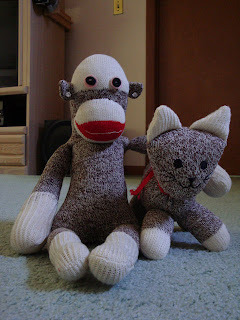 The sock monkeys are too numerous to mention, but you will see them featured below. My hometown is Pittsburgh, Pennsylvania where I was made by Mark's grandma. I am a big Steelers fan and Penn State fan (Laura's and Mark's alma mater). 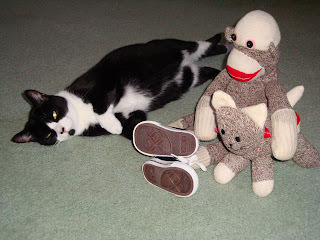 I'd like to take this opportunity to introduce you to my pal, Sock Kitty. She's a red heel, just like me. I usually keep her secluded upstairs for her own safety. I think you can see why. She is already drawing attention from the furry feline, Megan. The real one to worry about though is Karl. Of course he had to come check out the visitor from upstairs. He stretches out casually next to us, but don't let that fool you. It doesn't necessarily mean he wants to be friends. I am the Alpha male of my clan. Thanks to ebay, Laura keeps adding new members to my family. My best features are my pink eyes and my Popeye forearms.